Brent oil prices increased by 0.48 % or US$0.36, as prices rose this week. Oil traded on April 26, 2018 at a price of $74.69 per barrel relative to US$74.33 last week. Brent oil began the year at US$68.07 per barrel. 87 Octane prices increased week over week, by 1.19% (JMD$1.49). Additionally 90 Octane rosel by 1.17% or (JMD$1.49) week over week. 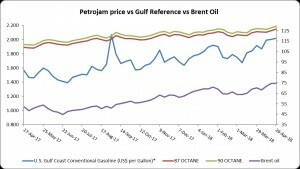 87 Octane and 90 Octane opened the year at J$121.04 and J$123.88 respectively and now trades at J$126.38 and J$129.22 per litre respectively. Some market participants think that there should be an oil price benchmark based on local supply and demand conditions due to the steady increase in Asia-Pacific oil demand. The trading of the new Shanghai crude oil futures contract in China commenced last month. The contract can only become regionally accepted as benchmark if it appeals to majority of the market participants and its usage for price discovery must be established. Unlike the Asian market who does not have a widely traded benchmark contract, North America and Europe both have oil futures contract namely, West Texas Intermediate (WTI) and Brent, respectively. The Dubai Merchantile Exchange’s Oman future contract is viewed as one belonging to the Asian Crude oil market. However, the volume traded, and its open interest continuously stands at a low level since the formation in 2007 which clearly suggests that market participants have not gravitated towards it. “The Asia and Oceania region represented more than 35% of global petroleum and other liquid fuels demand of last year, a rise from the 30% of petroleum demand in 2008.” Crude oil is used by many in the region who depend on it to meet domestic demand. “Imports to a select group of Asia-Pacific crude oil importing countries averaged a record-high 24 million barrels per day (b/d) in January 2018.” With an increase in trades across the region, a benchmark futures price that supports the local demand and supply environment could positively affect how market participants manage price risk.